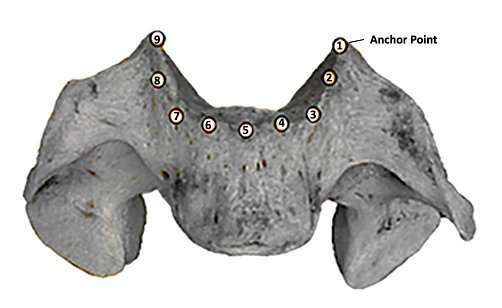 Published in the July edition of the American Journal of Physical Anthropology, the new research examined protuberances called uncinate processes on the spine that are responsible for stabilizing and guiding spinal motion, and assessed their form in six fossil hominins against modern humans and 99 nonhuman primates across 20 genera. Using new geometric morphometric methods for the first time on these structures, the researchers found clear differences between the spines of living primates that habitually suspend themselves from tree branches and those that do not. The new evidence uncovers striking differences between the vertebrae of fully terrestrial types and species of primates that brachiate, or swing from branch to branch, and may serve as a way to understand the different ways that extinct hominin species habitually moved about their environments. Fossils from east Africa dated to around 3.5 million years ago belonging to Australopithecus afarensis (Lucy's species) and from Homo erectus between 1.8 and 1.5 million years ago are a match for those of modern-day humans, suggesting that these extinct hominins had already evolved our dedication to terrestrial locomotion. In contrast, fossils from South Africa belonging to the hominin species Australopithecus sediba resemble those of tree-dwelling arboreal taxa. Lead author of the new research, Dr. Marc Meyer of Chaffey College, reports in the paper that while the South African species appears not to have been fully suspensory, their spines reveal adaptation to life in the trees. The study also included an team of researchers from University of California Berkeley, University of California Davis, the Spanish National Museum of Natural Science and the Universidad Autonoma in Madrid, Spain.